The nylon hammer fixing plug NHF is a time saving hammer-in nylon plug with pre-assembled zinc plated nail-screw. The nylon hammer fixing plug NHF expands when the nail is driven in, and holds by friction in the drill hole. Suitable for most types of base materials. Long expansion area, nail-screw with reinforced neck and pozidrive head. Fixture can easily be removed. 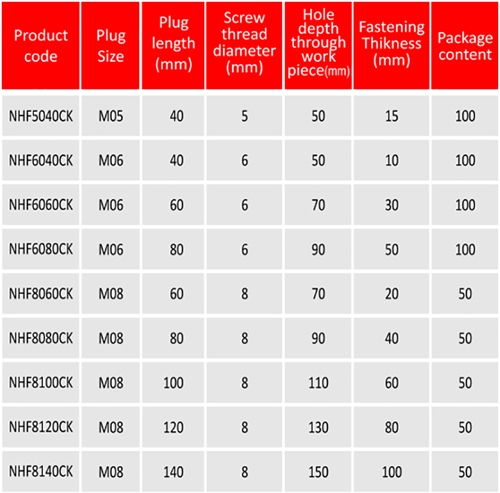 The nylon hammer fixing plug NHF is available with two different styles of head. 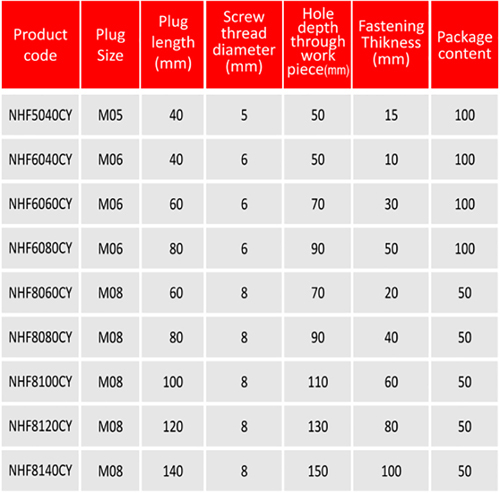 The countersunk head NHF-CK is for countersunk fix in thick materials and the cylindrical head NHF-CY is for round head fix in thin materials also available with 304 stainless nail for corrosive environments. • Deforming crumple zone allows for quick adjustment of depth on uneven surfaces. • Brand point allows for quick and easy insertion of the Hammer plug into the pre-drilled hole. • Long expansion aces provides a more efficient fix even in light weight aerated concrete. • Off-set block profile ensures that as plug expansion commences, it is held firm against the hole. • Knock in protection prevents premature expansion when driving in the screw, yet maker it possible to adjust the depth of plug in the hole. • Oblique thread using the barbed hook principle achieves good pull out figures without sacrificing speed of application. • Reinforced screw head facilitates high knock-in loads with the added benefit of grip around the plug neck holding the material firm. Recommended for use in dense concrete, natural stone, lightweight concrete, brickwork and aerated concrete blocks.